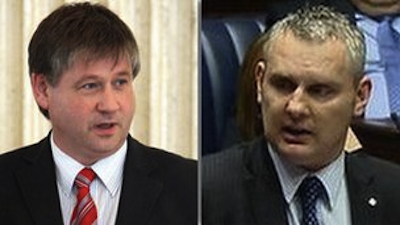 Basil McCrea and John McAllister expressed outrage at Nesbitt’s decision to support a joint unionist candidate with the DUP in the forthcoming Westminster by-election in Mid-Ulster. The move brings the two parties closer as a single unionist bloc, with the goal of maximising the unionist vote in future ‘sectarian headcount’ elections -- elections pitting nationalists versus unionists, regardless of other issues. Earlier this week, Nesbitt and DUP leader Peter Robinson named political novice Nigel Lutton as a joint candidate for the by-election, which is due to be held on March 7. Former UUP deputy leader John McCallister quit on a live television show on Thursday night. He said his decision to quit was “not personal” but “about the principle”. Basil McCrea this [Friday] morning said he had “no confidence” in his party leader. He said it was likely he and McCallister would set up a new party to challenge the DUP and the UUP. “John and I intend to form a real and viable opposition, hopefully with others,” he said. “I have stated that I will not stay in an Ulster Unionist Party that is heading towards a merger with the DUP and the decision that the party took yesterday against the wishes of people like myself and John McCallister leaves me with no option but to say that I, too, will be resigning from the Ulster Unionist Party,” he said. Mr McCrea added that it has been “clear for some time” that there was no future for him or Mr McCallister in the party. He also criticised UUP leader Mike Nesbitt, who he said had become a member of the Stormont Assembly with no political experience, outside his television talk shows. “I have no confidence in what Mike Nesbitt says. He came into this job with only nine months experience as an MLA, in fact he made a virtue of the fact that he had no big ideas. I haven’t seen any ideas other than we need to get into bed with the DUP,” he said. “There is an agenda in the party to get some kind of merger with the DUP for reasons that I don’t understand and I have made quite clear that I will not be party to it. Referring to the choice of candidate for the Mid-Ulster by-election Mr McCrea said it would become a “bitter sectarian battle”. “It is squaring up to be a bitter sectarian battle, going over things that happened many many years ago and whatever the rights and wrongs of those issues and obviously there were some tragic circumstances, do we really want to have the battles of the 1970s revisited,” he said. The Mid Ulster by-election due to take place in March was called to replace Martin McGuinness. Sinn Féin’s candidate will be Francie Molloy, the SDLP candidate will be Patsy McGlone while Independent Unionist William Frazer, the victims campaigner, has also expressed an interest in contesting the race. “I do not know what the Ulster Unionist Party stands for and I look to see what is the difference between it and the DUP. If there is no difference then they should merge,” said Mr McCrea. “If there is a difference, then they should stand on their own two feet. Fight elections on that and say to the people, we are different from our electoral opponents, please vote for us,” he said. Nesbitt and Robinson have repeatedly made joint announcements in recent months. Last month, amid widespread riots and disturbances by loyalists in the wake of a vote by Belfast City Council to reduce the flying of the British flag over City Hall, the two leaders advanced a plan for a pan-unionist forum. McCallister and McCrea will likely have the support of David McClarty, a former UUP Assembly member who last month said there is an onus on “moderate unionists” to consider forming a new party. Other potential supporters include Strangford Assembly member David McNarry and former party luminaries such as Ken Maginnis and David Trimble, both now elevated to Westminster’s ‘House of Lords’.